First Class (Dom & Int): The cheapest shipping method available. 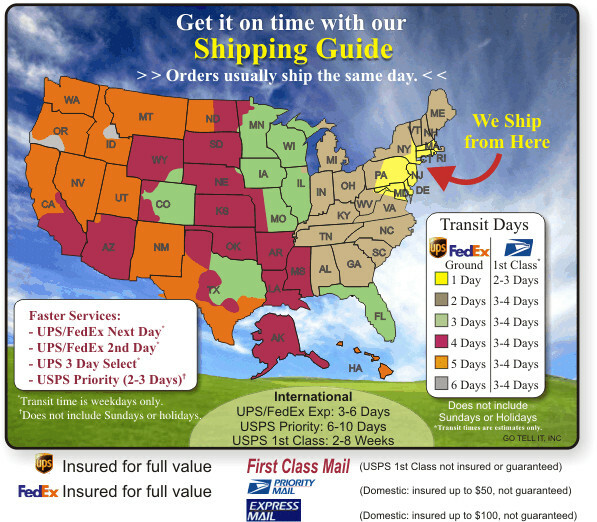 Please note, USPS 1st Class packages are NOT insured and NOT guaranteed. Priority (Domestic & International): Fast services; include up to $50 insurance, but Not guaranteed. Priority Express (Domestic & Int'l): Fastest service;includes up to $100 insurance, but Not guaranteed. All services are insured up to $100. All services guaranteed except UPS Ground. All services are insured up to $100. All services guaranteed except FedEx Ground. All rates, times and services subject to change without notice.